Our second fully managed block train checks another First: being the first intermodal train connecting the two most prominent markets of CEE region, Poland and Romania. This block train was a real challenge for our Intermodal team, implementation-wise, given the lack of railpaths over Tatra Mountains. In order to overcome this, train runs over 1.000km spread over 4 borders (RO-HU, HU-SK, SK-CZ and CZ-PL) in 36h (terminal to terminal). each Friday – Spedcont, Lodz (PL). Current fleet includes 45′ Pallet Wide High Cube Containers and the traction operations at each end are handled smoothly by dedicated carriers. As of September, frequency will increase to 2 trains/ weel/ direction. Until the end of 2018, we plan to reach a composition of 40 units per each train. 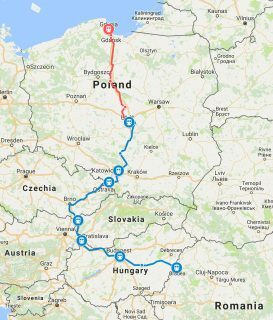 This new connection opens up options to further connect with Scandinavia via the already existing line from Lodz to Gdynia and then continue by ferry. As for the Balkans, clients can benefit from already existing block train running from Curtici to Stara Zagora (via Rousse).